Think about your competition for a second. Is it that big company in town? Is it that one agent who seems to get every listing? Is it a manager who you believe is holding you back? Or just maybe… is it none of the above? With $86 billion available in U.S. commissions annually, if you believe the so-called “competition” is preventing you from greatness, it’s time to adjust how you view your business. Success in life and business is all about realizing you’re only competing against yourself. Your success is dictated by your mindset, your effort and your strategies. There are two ways to look at the world — from an abundance mentality or a scarcity mentality. A person operating from an abundance mentality believes that there’s enough to go around for everyone — money, deals, ideas, opportunities, you name it. When someone else has a great idea, it doesn’t prevent me from coming up with another great idea of my own. One who operates from a scarcity mentality believes there’s a finite amount of opportunity in the world. A dollar earned by the guy in the office next to me is a dollar less I can earn. Which mentality do you live by? Training yourself to operate from an abundance mentality is a huge key to success in a business as competitive as real estate. It’s often a matter of where you choose to focus. Let’s say you give a listing presentation, but ultimately the homeowner lists with another agent. Sign of the apocalypse? Uh, no. Not by a longshot. An agent with a scarcity mentality dwells on that defeat and allows it to drag him or her down, creating negative thoughts and diverting focus from where it needs to be. 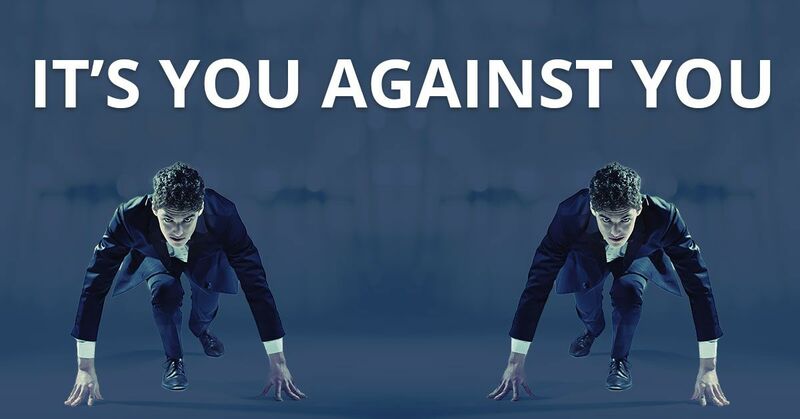 Competing “You against you” means taking action to better yourself every single day. It means making growth objectives part of your big-picture goals. It means refining the things you’re already doing to become more efficient, and ultimately, more productive. You’ll find when you make yourself your strongest competitor, you’ll put yourself in situations that lead to growth. You’ll attend more training events. You’ll make sure you hold yourself accountable to ensure you achieve your desired growth. • How are you working on yourself? • What area(s) of your business need improvement? • What area(s) of your business need refinement? • How many events have you committed to attending? • What systems do you have in place to hold yourself accountable to your goals? Full disclosure: I know it’s difficult to do everything you need to do… generating leads, following up on leads, serving your clients, handling a million requests. With all this STUFF you have to do every day, how are you supposed to work on growing your business? Why do I know this? Because I’m wrestling with these same questions as a company right now. We have really aggressive goals, and I know we need to shake things up if we want to achieve them. Just earlier this week we met with GrowthHackers, and one of the questions that came up was how to balance the everyday tasks vs. these lofty growth-related goals. So that’s what I’d tell you as well. If you want the growth in your business, adopt the mindset that the only one holding you back is yourself. Become your own greatest competitor and continually work on those things that will create a better YOU. One of the greatest advantages of adopting this approach to your business is that it doesn’t allow you any excuses. You accept the responsibility, and you reap the rewards. You’ll be happier in your business and more positive in your day-to-day outlook. You got into real estate because of the freedom to run your business how you desire with an unlimited ceiling on what you can earn. The flip side of that freedom is it can land you in a vacuum with no one to tell you your mindset is doing more harm than good. That’s why I’m bringing it up as your Coach. Adopt an abundance mentality, commit yourself to competing only against yourself, and go become the absolute best YOU that you can be. Leave a comment below to tell me one commitment you’ll make TODAY to improve yourself. If you need a place to start, see TomFerry.com/events and choose an upcoming event to attend.